After a few days of Bali’s famously crowded markets and one blurry night at the Sky Garden, I was ready to leave behind our epic villa and party vibe of Kuta and immerse myself in the mountain tranquillity of Ubud. A charming place with the perfect amount of enticing restaurants, quiet retreats and hippy hangouts. Ubud is everything you have heard about and more. And of course, a great place to get a massage or partake in a yoga class. Rain beat down as our taxi drove slowly through the winding main streets, hedged by small shops and countless shrines and temples on the way to our hostel. We had decided to trade the famous villa life for a more social experience. Our hostel was located at the top of a steep hill on the end of town. Walking through delicately adorned traditional doors into a lush tropical garden complete with hammocks and a long pool, I couldn’t help but feel like I had stepped into the set of Eat, Pray, Love (despite being soaked head to toe from the rain). After getting settled, we jumped in to meet the array of travellers from all over the globe. Happily sharing travel stories and tips, they all recommended we head straight to The Monkey Forest. 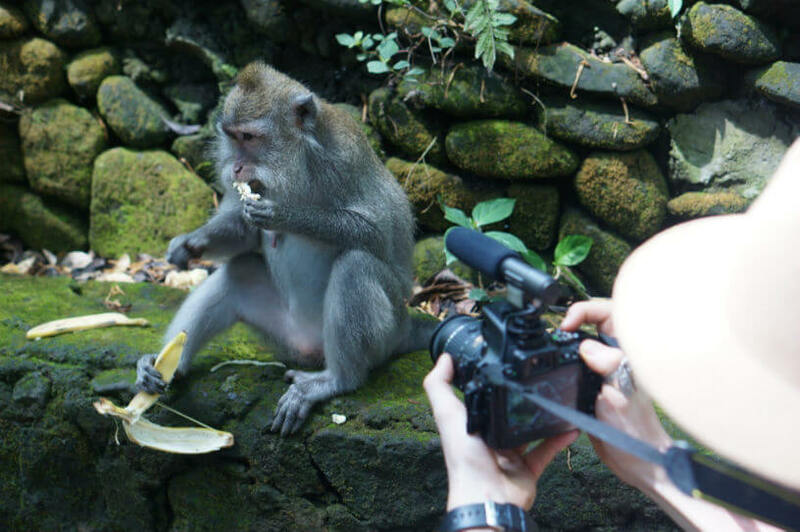 If you like your wildlife encounters up close and personal, The Monkey Forest is the place for you. After I purchased some bananas from a small stall, I made my way into the forest. 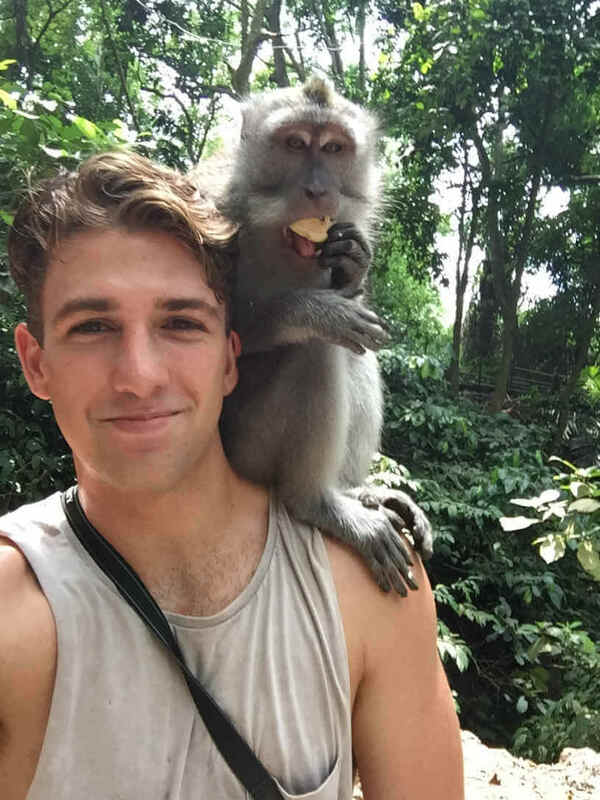 One moment later, a large monkey had zeroed in and jumped onto my shoulder to have some lunch. He then mistook me for a toilet – much to the amusement of onlookers. I laughed it off and made my way to a small market stall up the road to get a replacement shirt. All I could find was what could best be described as the Balinese version of a Hawaiian shirt, but I didn’t have a lot of other options. Bright shirt on, we then headed further into The Monkey Forest to find the main temple. It was in a giant precinct where tourists and monkeys mingled freely. I grabbed some more bananas, which were quickly stolen by a huge monkey. He happily snatched the entire bunch and walked off confidently. 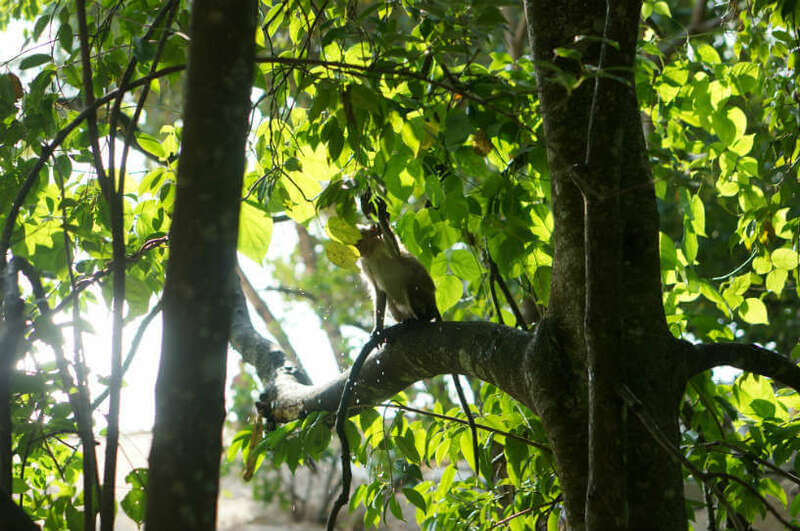 I then took my colourful-self down one of the less beaten tracks and further into the forest, where I found monkeys playing in their natural environment. It allowed me to capture some pretty cool action shots. I then took up a vantage inside the large temple and people/monkey watched for a while, before I headed out of the forest in search of lunch. There are plenty of great places to eat in Ubud, we a beautiful little restaurant that served a sampling platter of a few local favourites, including delicious chicken skewers and nasi goreng and was perfectly paired with a cold Bintang. I let my meal go down then headed up the road to a great little massage parlour nestled at the top of a jungle staircase on a small plateau. The smell of incense filled the air as I was handed a soothing tea. I was then treated to a warm scented oil massage. Afterwards, I stumbled home feeling drunk from relaxation - concluding a great first day in Ubud. 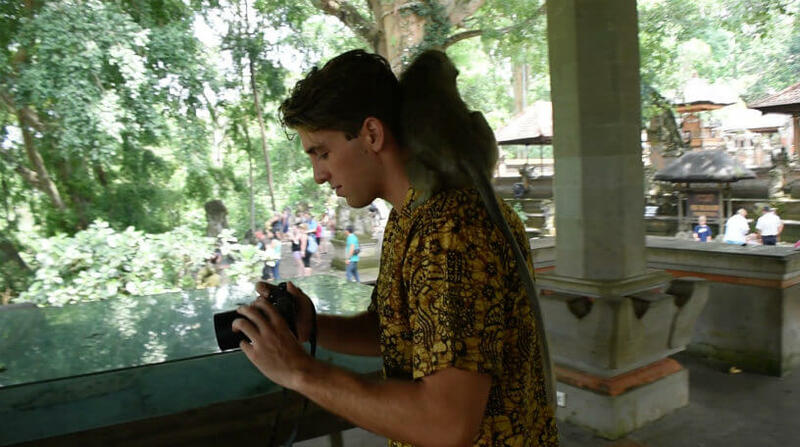 If you are going to The Monkey Forest bring a spare shirt or suffer the colour consequences – trust me. Stay in a hostel! Get amongst it and socialise. Not only do you meet more people and have more fun, but it also makes you appreciate the creature comforts of your next hotel even more. There is a long warning list for dealing with monkeys which you should take not of but my big tip is to stay calm and go with the flow. Relax! I don’t care what anyone says, the best start your day on holiday in Ubud is: yoga, massage, breakfast. If that doesn’t put you in holiday mode I don’t know what will. Scott Bidmead is an international journalist, travel TV presenter and writes for lifestyle and news outlets.